How did the conduct of business come to be so different in different countries? Why are some less developed countries in the process of rapid industrialization while so many others remain poor? Analysts often point to national differences in the cultures of business to explain these patterns. What then, accounts for these differences in culture? We can gain some insights into these issues by considering the incentives that are likely to shape the behaviors of upwardly mobile sub-elites. Patterns of elite initiatives in the early years of industrialization have an enduring impact on the subsequent conduct of business. Understanding the impact of history can provide important insights into contemporary business practices. Viewed from the perspective of developmental history, apparently independent phenomena can often be seen as different aspects of a common pattern. Questions about the relation between our collective past experiences and future performances are also relevant for our understanding of democratic self-governance. Governments are generally engaged in nation building. What works? Why? Where are we collectively headed? This volume suggests some answers. Author David Hanson develops an analysis that focuses on governing elites, the need for security, and the search for status. His analysis rests on considerations of social structure, conflict, and psychology rather than on resources, markets and economics. 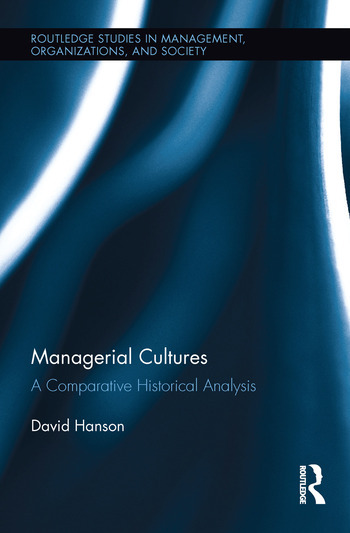 The result is a book to offer international managers an understanding of history’s critical role in fully understanding the societies in which they operate. David P. Hanson is Associate Professor of Global Business in the Donahue School of Business, Duquesne University, USA.